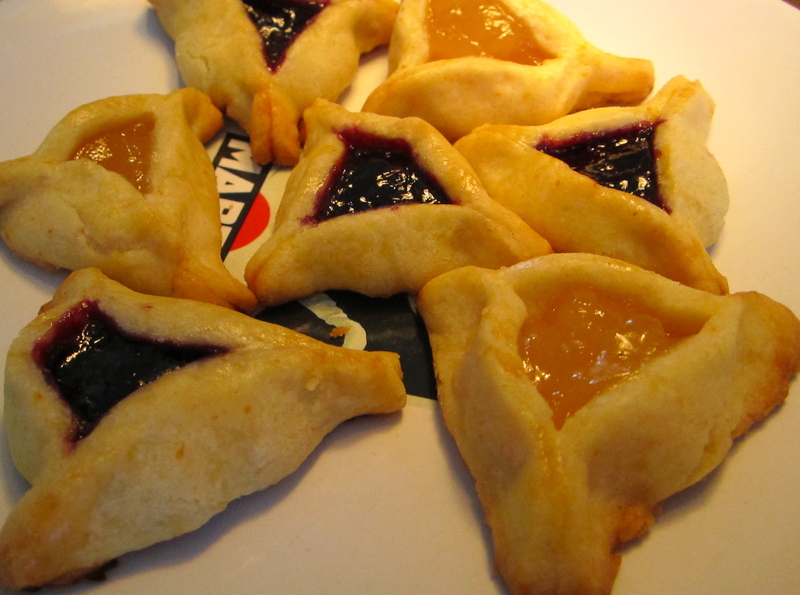 You’re invited to a Purim party/Hamantaschen bake-off. While you have eaten your weight in Hamantaschen over the years, you’ve never actually made the delicious little tri-cornered darlings yourself. You go to Smitten Kitchen. You are, as always, rewarded. You eschew traditional poppy seed filling in favor of lemon curd and Boysenberry jam. You realize four hours before judging that you have neither the called-for lemon nor the ambition to go get one. You swap in a clementine. You bake up delicious Hamantaschen. You feel slightly like a fraud, since your ‘taschen are, like yourself, all Gentile. You feel compelled to share the recipe you tweaked. Bust out your food processor, plunk sugar through zest in and pulse it to blend. Your Small Sous Chef can help with the pulse button. Buttons, as we all know, are awesome. Now, get your button pusher to switch to On. With the machine running, pour in your yolks and cubed butter and let it go until the dough comes together in a mass. Have your child stop the machine, then disappoint him by not allowing him to play with the wicked sharp blade remove the dough. Wrap the dough in plastic wrap and chill for an hour at least. Roll the dough out less that 1/4″ thin. Have your Small Sous Chef help you cut 2 1/2″ rounds with the rim of a wineglass a cutter. Transfer your rounds to two parchment lined trays. We yielded 4 dozen plus a small ball of raw dough for Mark to sample. Now, fill half of them with approximately a teaspoon of lemon curd and half with approximately a teaspoon of jam. Mix your reserved eggwhite with a spash of milk. Brush the edges of the ‘taschen with this egg wash. Pinch the sides into three corners. Brush the tops and sides lightly with more egg wash.
Chill for 20 minutes while you preheat the oven to 350 degrees. I baked mine for 15 minutes per tray, one tray at a time. When they’ve cooled a little, transfer to a cooling rack. Bring them to a bake-off and bring home your bragging rights! You really won a bake off? I’m all kinds of jealous. Where can I find a bake off? It was a casual competition amongst friends, but yes. And I found mine in the home of longtime friends. Looks fantastic. I am all kinds of impressed that you won a baking contest. That’s the sound of my stomach growling. Or maybe it’s my soul. As a competitor I have to admit, they really were quite excellent. In fact, we stole some and I plan to imbibe again tonight. yummmmmmmm congratulations lovely shiksa and thank you for sharing! Ok, a wineglass as a cutter, and milk measured by the spash… I just may have to try this one! Those look delicious. Where is the giveaway to have a fresh batch of those sent to the winner? I ate so many hamantaschen yesterday that I am surprised I didn’t explode. They look awesome. I am 22 kinds of jealous over this. Though I am secretly pleased that you did not make your own fillings like Smitten did. lol! you are just too cute, and so are these lil hamantaschen! can you feel how green I am over here? Mmm.. I will be baking some of these bad boys tonight! CONGRATS! time to hit the grocery to buy some ingredients and make these tonight. Congrats! they look beautiful, I had to physically restrain myself from licking the computer screen! Everything on Smitten Kitchen is wonderful, I love that lady! This year I tried something I’ve never even heard of before, yeast based hamentashen dough. they were very, very different. and i think good! I’m getting a restraining order against your blog….. I put on ten pounds just looking at it…….DELISH! Oh how I long to eat those cookies! I’m off dairy for a year so I can’t bake them…but I think I’ll just lick the screen instead. Qué buena pinta tienen! gracias por compartirlo. Felicitaciones! They look wonderfully delicious. I don’t think you could just eat one of them. Thanks for sharing! Love it! I’ve only had hamantaschen once or twice and they were dry, dry, dry and too heavy. These look delightful! now you def have a right to brag!! !lol ur on fp too now!!! haha great post! Congrats for being featured on freshly pressed. So glad to have discovered your blog. Your hamentashen are adorable! One year we filled ours with raisins, sugar and cinnamon and piped the tops with white icing. We called them cinnamon bun hamentashen and they were a huge hit. Hey congrats on winning and also on FP, It’s a double win for you! Well done! I will have to taste these for myself. Please send out for delivery immediately. Congrats on being FP and winning the bake-off!! These look yummy! wow! Purim makes Freshly Pressed! Your hamantashen looked beautiful. We made bagfuls ourselves every year and give them to our friends. Now, after all this Purim feasting, I have to get myself back to the gym! How can you win a contest with store-bought lemon curd? Contest puts it strongly-it was a friendly bake-off at a party, and there’s a certain tongue-firmly-in-cheek element to the post you seem to have missed. Congratulations on your victory! I would have never thought of using clementines! These look fabulous, I have never tried one…. I am new here on wordpress, coming from blogger! It’s such change, and Im having trouble adjusting! Oh I love it, I’m going to try. Sounds good. Gonna have to try this one out for sure. I love that the kids get involved. And now for the post-call sleep. Shhh! That one’s a secret! The story of Purim is one of my favorites. I have always wanted to make these, and had great intentions of doing so last week. Now that I have a prize-winning recipe, surely there are no excuses left. I will make them! Yummy…I’m going to try ’em. Glad to hear you won the get together, and I’m totally saving that recipe for later! Thank you for posting it, they look awesome! Won the bake-off, Freshly Pressed and named one of WordPress’ fastest growing Blogs — wow the Triple Crown! Congrats. The Hubby will go gaga over these! YUM! Congrats on Freshly Pressed. Wonderful post, thanks for the laugh and the great recipe!